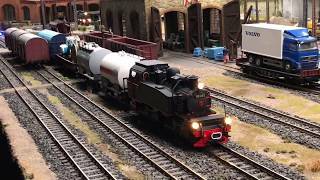 This is Kolejkowo, the largest model train in Poland. It is located in the old German train station Wrocław świebodzki. The total surface of the platform is 335 square meters, it has more than 500 meters of rails, 15 locomotive, 60 wagons, 215 cars, 242 miniature houses, and more than 3000 miniature figures. If you like the video, please subscribe, give us a like and let us know what you think about it!